Abstract.—An abandoned high-level river valley extends from the Kentucky River near Carrollton, Ky., northeast to the mouth of the Great Miami River at Lawrenceburg, Ind., a distance of about 40 miles. The geographic location, gradient, and fluvial-sediment content of this valley identify it as the preglacial course of the Kentucky River. It follows closely the Ohio River valley but only locally coincides with it Glaciation reversed die flow of this part of the ancestral Kentucky River and established the course of the Ohio River downstream from Lawrenceburg. Glacial deposits filling the preglacial valley probably prevented the newly formed Ohio River from occupying most of the old valley. The preglacial course of the Kentucky River and its role in the development of the modern drainage system of the Kentucky-Ohio-Indiana areas has long been a problem. The earliest workers in the area concluded that the preglacial Kentucky joined the ancestral Ohio River near the present confluence. Other workers have described theKentucky as part of a northward-flowing drainage system that predated the development of the Ohio. Recent mapping along the Kentucky side of the Ohio valley between Cincinnati, Ohio, and Carrollton, Ky., has delineated an abandoned high-level river valley that I believe to be the preglacial course of the Kentucky. This report describes this preglacial valley and the glacial deposits in it and relates the valley and deposits to the subsequent development of the major drainage system of the region. Leverett (1902) and Fenneman (1916) believed that downstream from the mouth of the Great Miami River the preglacial course of the Ohio and Kentucky Rivers was virtually the same as today. 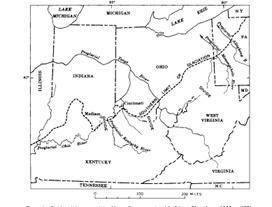 Malott (1922) and Fowke (1933) described the preglacial Kentucky as flowing northeastward from the area of Carrollton along what are now the Ohio and Great Miami valleys. Jillson (1946) described an abandoned river valley 6 miles east of Carrollton and concluded that it was the preglacial course of the southwest-flowing Ohio. Wayne (1952), in describing the evolution of the Ohio and Wabash valleys, summarized much of the previous work in the region and gave further evidence supporting a northeast-flowing Kentucky River. Durrell (1961) discussed a preglacial north-flowing river system in the area southwest of Cincinnati but considered it to be the Eagle River. The preglacial drainage of the region has been called the Teays River system (fig. 1). The Teays flowed northwestward across West Virginia and Ohio, then generally west across Indiana and Illinois to join the Mississippi. The preglacial Kentucky River flowed northwest virtually along its present course to the area of Carrollton. From here it flowed northeast, was joined by the Licking River north of Cincinnati^ and then continued northward to become part of the Teays River in central Ohio. The ancestral Ohio (fig. 1) headed on a divide near Madison, Ind., and flowed southwest. An advance of glacial ice southward into Ohio, Indiana, and Pennsylvania ponded the north-flowing streams and caused them to spill westward over several major north-south divides, initiating a new southwest-flowing drainage system, the Ohio River. The Allegheny and Monongahela Rivers were diverted southwest into a tributary of the Teays system. The ponded Teays spilled over a divide into the Kentucky drainage and flowed northwest along a tributary of the Kentucky to the area north of Cincinnati, where the new river turned southwest, reversing the direction of flow in a segment of the preglacial Kentucky River valley. With the breaching of a major divide at Madison, the drainage reversal was completed, and the modern Ohio River was established in this area. The abandoned river valley departs from the modern Kentucky River valley about 4 miles upstream from Carrollton (fig. 2). The river flowed northeast through a series of large meanders that, with only one exception, were in or south of the present Ohio valley. East of Warsaw, Ky., the river was joined by the preglacial Eagle Creek and flowed northward along a widely meandering course that was largely east of the Ohio valley. The northernmost point of the abandoned valley inKentucky is on the Ohio bluffs directly opposite the mouth of the Great Miami valley. The path followed by the preglacial Kentucky River was quite sinuous, extending a distance of approximately 95 river miles to cover an air-line distance of less than 50 miles. The width of the meander belt ranged from 4 to 5 miles. Although the overall trend of the abandoned valley agrees fairly well with that of the Ohio, the Ohio actually lies along the northern and western edge of the old meander belt, and only locally do the two valleys coincide. Figure 1.—Preglacial drainage of the Ohio valley region (modified from Thombury, 1969, p. 389). The old valley is incised to a maximum depth of about 200 feet in virtually flat-lying interbedded limestone and shale of Late Ordovician age. Its floor is 200 to 250 feet above the modern Ohio River. At the southwest end, the bedrock floor of the valley is at an altitude of approximately 670 feet. At the northernmost point of good elevation control (fig. 2) the floor is at 630 feet. This is a drop of 40 feet in a distance of about 85 river miles, or a gradient of approximately 6 inches per mile. The modern Ohio has a gradient of 4 inches per mile in this area. Throughout most of its length, the abandoned valley has been occupied and deepened by modern streams that range in size from the Ohio River to small intermittent creeks. The preservation of the valley and the accuracy with which it can be traced depend largely on the size of these streams. The abandoned valley is well preserved in the southern part of the area between the valleys of the Ohio River and Eagle Creek. Here it is marked by fluvial deposits that form well-developed terrace remnants 40 to 80 feet above the present creeks. These remnants cap flat-topped bedrock spurs that extend out from the sides of the present valley and slope gently toward the creeks. The best preserved terrace remnants are in the large meander 12 miles east of Carrollton. These terrace remnants are as much as 1,500 feet wide, and some deposits continue up the old valley wall to heights of nearly 100 feet above the channel floor. Where the Ohio River occupies segments of the old valley, the original valley profile and all fluvial deposits have been removed by erosion, and the position of the abandoned channel within the 2-mile-wide Ohio valley can only be inferred. The longest such "missing" segment is near Rising Sun, Ind., and is 7 miles long. Intermediate between these two extremes of preservation are segments of the abandoned valley now occupied by steep and deeply entrenched creeks that empty directly into the Ohio. These creeks have deepened the valley as much as 200 feet and have extensively modified its shape. Evidence for the old valley is largely limited to small patches of fluvial deposits well up on the old valley walls. 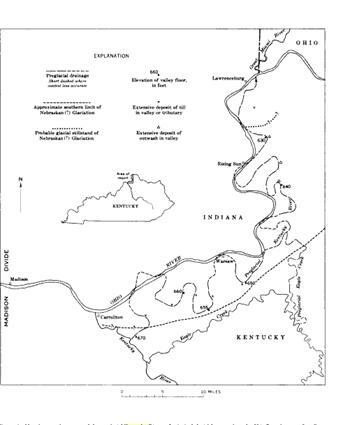 Figure 2.—Map showing the course of the preglacial Kentucky River and principal glacial features along the Ohio River between Carrollton,Ky., and Lawrenceburg, Ind. the contact of the bedrock with the fluvial deposits of the valley floor. The deposits of the channel and those mantling the slip-off slope of the meander are still intact except where dissected by the headward erosion of lateral tributaries. In straight reaches of the river the modern streams tend to be incised in the center of the old valley; they have removed much of the channel deposits and have left small terrace remnants along each side of the valley. Seven miles east-northeast of Warsaw, Ky., streams along both sides of the preglacial valley have left the valley-floor deposits capping a ridgetop and have produced a topographic reversal. The gravel consists of four types of material: quartz and chert pebbles, fragments of chert and silicified limestone, quartz geodes, and blocks of sandstone. The quartz and chert pebbles are white, yellow, or brown, well rounded, and generally less than 2 inches in diameter, resembling those in the Pennsylvanian-age conglomerate of southeastern Kentucky. Chert and silicified limestone occur as subangular to subrounded pebbles, cobbles, and blocks as much as 12 inches across. Most are some shade of brown, but others are gray and white; some include silicified corals and crinoids of probable Mississippian age. Geodes containing yellow or brown quartz are present throughout the deposits. They range from 1 to 18 inches in diameter and were probably derived from Mississippian-age limestone of south-central Kentucky. The least abundant component of the gravel, blocks of light-brown, medium- to coarse-grained micaceous sandstone as much as 2 feet across, occur locally. All the clasts in the gravel seem to have a southern origin and are similar to those in the alluvial deposits bordering the presentKentucky River. Outwash sand and gravel as much as 150 feet thick occur in the abandoned valley of the Kentucky River in the northern part of the area (fig. 2), where the glacial deposits are readily distinguishable from the older fluvial deposits. The glacial gravel is composed of mostly subangular to subrounded limestone fragments as much as a foot across with smaller amounts of well-rounded pebbles and cobbles of igneous and metamorphic rocks. It is crossbedded, poorly sorted, and well cemented, standing in cliffs as much as 80 feet high. To the south, particle sizes in the outwash decrease sharply. The southernmost deposit of outwash (fig. 2) consists of fine to coarse, moderately well sorted sand with only minor lenses of gravel and pebbly sand. The sand is more evenly bedded than the gravel, stained by limonite, and largely uncemented. Thick deposits of till occur in several segments of the abandoned valley in the southern part of the area and at one locality in the northern part along a small unmapped tributary about 3 miles southeast of Lawrenceburg, lnd. (fig. 2). The till is a medium-gray calcareous silty clay containing scattered sand grains, fragments of limestone from local sources, and well-rounded pebbles, cobbles, and boulders of igneous and metamorphic rocks. In most natural exposures the till is deeply weathered and leached of calcareous material. It consists of reddish-brown clayey silt containing clasts of siliceous composition and of the more resistant igneous and metamorphic rocks. The maximum exposed thickness of till is about 80 feet. The southward advance of glacial ice into central Ohio blocked the preglacial Teays River and its tributary, the Kentucky, forming a proglacial lake that overflowed to the southwest across the Madison divide and initiated the development of the modern Ohio River. The glacial deposits along the abandoned Kentucky River valley suggest how this stream diversion may have occurred. Approximately 5 miles south of Lawrenceburg are indications of a temporary glacial stillstand (see fig. 2). North of this line, the preglacial valleys contain deposits of till but very little outwash. South of this line, the old valley and several tributary valleys are largely filled with outwash that may have been as much as 200 feet thick. Immediately south of the probable ice-front position, the outwash is largely coarse gravel that is strongly crossbedded, the beds dipping generally south. Nearby, a small valley that joined the Kentucky from the southeast was filled with sand and gravel deposits that lap onto the valley sides to a height of about 830 feet To the south in the main valley, the outwash is almost entirely sand. After this pause the ice advanced farther south into the lake, overriding the outwash delta. The ice moved across almost all of the preglacial valley and terminated a very short distance beyond (fig. 2). Till was laid down over the area, the thickest deposits being preserved in north-south segments of the valley. Throughout most of the valley the till rests on fluvial sediments; however, locally, the sediments and some of the underlying bedrock have been removed, probably by glacial scour, and here the till rests on bedrock. Because the glacier was advancing into the proglacial lake, there was little erosion of sediments by melt water in advance of the ice. Only minor amounts of outwash gravel were observed underlying till, suggesting that no proglacial valley train was deposited. It was while the ice stood at or near the southern limit that the first significant downcutting occurred at the Madison divide. As the divide was lowered and the lake began to drain, melt water and probably much of the drainage from the area to the northeast cut a new ice-front channel that is now occupied by the southwest segment of Eagle Creek. The extent of the downcutting by melt water in this valley compared with postglacial erosion by Eagle Creek is not known. However, the lack of any significant valley paralleling the glacial front east of the big bend of Eagle Creek indicates that such ice-marginal melt-water channels were rather limited. As the glacial front retreated from its southern limit, the newly cut Eagle valley was abandoned as a melt-water channel. It was at this time that the Ohio River of this area probably came into existence. The preglacial Kentucky River valley was effectively blocked by outwash and till at several points and perhaps for the entire length between Carrollton and Lawrenceburg. The Teays drainage system to the east and northeast was still ponded. These lakes drained southwestward along the glacial front and, augmented perhaps by melt water, cut a new and straighter valley. The new Ohio River formed, possibly as an ice-margin stream, along the western and northern edge of the Kentuckymeander belt and only locally occupied segments of the preglacial valley. During a subsequent glaciation (Durrell, 1961) the Ohio River upstream from Lawrenceburg was diverted from the north to the south side of Cincinnati, and the Great Miami River was formed. This study has revealed no conclusive evidence concerning the age of the glaciation that diverted the Kentucky River in this area. The presence of Illinoian Till in the modern Ohio valley near Warsaw requires a pre-Illinoian age for the diversion and for the formation of the Ohio. Wayne (1952) attributed the diversion to Nebraskan Glaciation. Durrell (1961) suggested a Nebraskan age for the formation of the Teays River system and a Kansan-age diversion of the Teays to form the Ohio River. Ray (1966), in a discussion of the glacial deposits of northern Kentucky, described both Nebraskan and Kansan Till in the map area and assigned a Nebraskan age to the formation of the Ohio. Field evidence indicates that the preglacial Kentucky River flowed northeastward from the area of Carrollton to the mouth of the Great Miami River along a course that generally follows but only locally coincides with the Ohio River valley. Ponding by pre-Illinoian glaciation, probably the Nebraskan, produced a proglacial lake in the ancestral Kentucky River valley that spilled over the Madison divide, reversing the preglacial direction of flow. The divide was breached when the glacier stood at or near the southern limit of advance, but the course of the Ohio River across this area became established after the ice had retreated from its southern limit. Extensive glacial deposits in the preglacial Kentucky River valley prevented the Ohio from occupying most of this old valley. Durrell, R. H., 1961, The Pleistocene geology of the Cincinnati area, in Geol. Soc. America, Guidebook for field trips, Cincinnati meeting, 1961: New York, Geol. Soc. America, p. 47-57. Fenneman, N. M., 1916, Geology of Cincinnati and vicinity: Ohio Geol.Survey, 4th ser., Bull 19, 207 p.
Fowke, Gerard, 1933, The evolution of the Ohio River: Indianapolis, Ind., Hollenbeck Press, 273 p.
Jillson, W. R., 1946, The Easterday abandoned channel of the Ohio River, a study in Pliocene drainage, physiography, and geology: Frankfort, Ky., Roberts Printing Co., 43 p.
Leveret t, Frank, 1902, Glacial formations and drainage features of the Erie and Ohio basins: U.S. Geol. Survey Mon. 41, 802 p.
Malott, C. A., 1922, The physiography of Indiana, in Handbook of Indiana geology: Indiana Dept. Conserv., Div. Geology Pub. 21, p. 59-256. Ray, L. L., 1966, Pre-Wisconsin glacial deposits in northern Kentucky,in Geological Survey Research 1966: U.S. Geol. Survey Prof. Paper 550-B, p. B91-B94. Thombury, W. D., 1969, Principles of geomorphology (2d ed. ): New York, John Wiley & Sons, 594 p.
Wayne, W. J., 1952, Pleistocene evolution of the Ohio and Wabash valleys: Jour. Geology, v. 60, no. 6, p. 575—585.